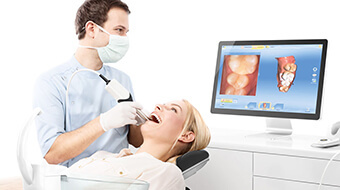 You may not think dental technology makes much of a difference at your oral health appointments, but you’d be surprised how significant the use of technology is in making dental care comfortable, quick, and convenient. At Pelican Landing Dental, we use a variety of innovative dental technologies on a daily basis to create a superior patient experience at every appointment. Call our team to find out more about dental technologies or schedule an appointment in our Bonita Springs, FL dental practice. We use photos of areas of oral health concern with your teeth as an educational tool during your appointments in our office. It’s not always easy to understand complicated dental decay or damage and the wide array of treatments based on our descriptions, though we do our best. Instead, we can show you images of your specific oral health concerns that will help us to clearly explain why dental intervention is needed and how we can help. 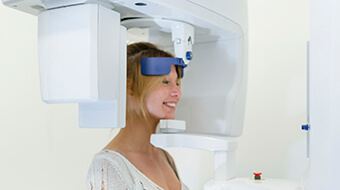 We use digital x-rays to provide patients with high-definition images of their underlying dental structures. 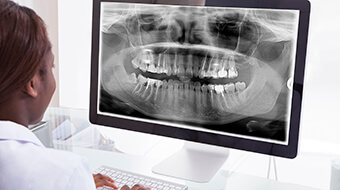 Unlike traditional x-rays that had to be developed and viewed on specialized light boards, digital x-rays are easily viewed, enhanced, stored, and transferred electronically. These clear images are immediately available for instant diagnosis with no need to wait on films to be processed. We can also compare x-rays from appointment to appointment to pinpoint any changes in the earliest stages. If you’re in need of more advanced treatments (including dental implants), our Cone Beam CT Scanner provides our dentists a 3-D image of your jaws. We are able to clearly identify vital structures such as the sinuses and the nerve that runs through your jaw. Furthermore, we have the ability to virtually place any manufacturer’s dental implant into the jaw by utilizing advanced software - thus allowing us to place the appropriate implant for the circumstance and in the most ideal location. Better still, we can utilize this software to provide computer-guided implant surgeries – often without a single suture! 3-D Imaging leads to better and more predictable treatment outcomes.